Ski season comes but once a year for most of us, so it’s unsurprising that by the time winter rolls around, our bodies aren’t at peak ski fitness. Skiing out of shape can increase the chance of injury, so if you’re feeling physically unprepared, your trip may be tinged with anxiety about what’s in store for you on the slopes. 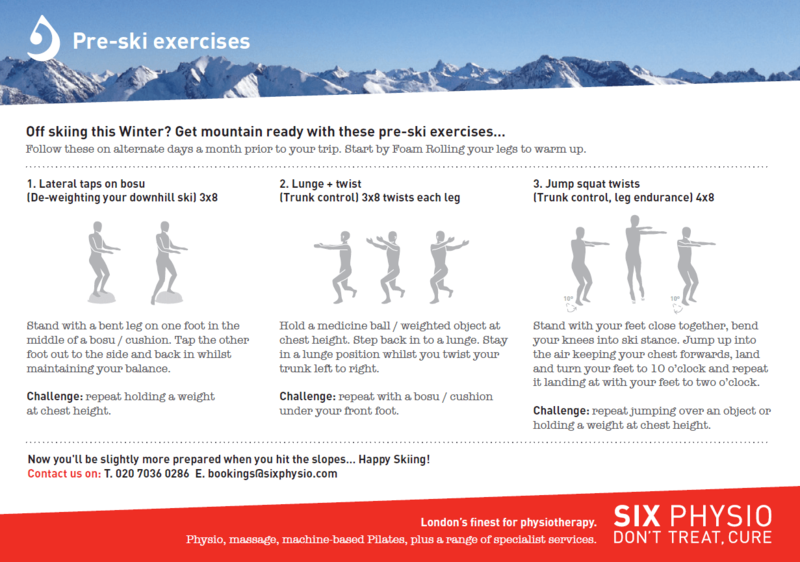 But with simple exercises and dedication, you’ll be flying down those red pistes or gentle blues with ease. Chris Myers, clinical director at Complete Physio, who has worked with members of the British ski and snowboarding team, adds that it’s this unaccustomed activity which is what the body struggles to cope with. It is often why injuries occur. “The correct preparation is the key to preventing many common aches, pains and injuries,” he says. 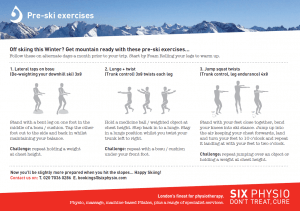 So ski fitness is easily lost, but it’s also relatively straightforward to get back to optimum level when the snowy slopes begin to beckon, but it does take dedication. “The harder you work before you go, the better you will feel on the slopes,” says Sarah. “This should involve some cardio, pilates-based strength and core control and balance work.” Sarah recommends ideally starting your training around 8-12 weeks before your intended outbound date. The muscles we use most when skiing – and therefore the ones we need to focus on – include the core, which is crucial for maintaining balance and stabilising your pelvis and spine. Your gluteal complex is also one of the most essential and powerful muscles groups in skiing and also needs focus. These act as stabilisers around the hip and help with extension and external rotation of the leg, allowing the rotary movements you need to turn your skis and maintain a parallel position. Leg muscles are also key, with the outer compartment of the lower leg controlling pressure on the outer foot enabling you to edge on your skis. The calf complex allows you to maintain and adjust to an optimal ski position, while the quads hold you in position and provide knee protection. Feet and ankles are also a crucial muscle group, responsible for edging, pressure and rotational movements. In the upper body, muscle strength is necessary for stabilising your spine, and arm muscles are needed when planting poles in the snow. Dedicated classes dotted around London and Surrey cater for those keen to train these muscles throughout the year. Chel-ski is an indoor ski and snowboard facility in Chelsea that runs classes under the supervision of qualified instructors. Head instructor Daniel Crawford recommends their Fit-Ski classes as a way to focus training. The class comprises a 30 minute off-slope warm up and 30 minutes of on-slope exercise on skies. Ultimately, your ski holiday is a precious week that always flies by, so get started on your fitness regime, work on your core strength, and keep exercises up on a daily basis so as to enjoy every single second in the snow.